We get it. We’re fat. Americans are fat. Europeans are fat. And the rest of the globe is quickly catching up. And, yes, excess weight is very, very bad. Gaining too much weight boosts your risk of cancer, heart disease and, well, 17 other terrible things that we’ve written about before. So, do our chubby thighs and seems-like-we’ll-never-shed-it baby weight always spell disaster? Is there any silver lining at all? Maybe. Here are four surprising things you may not know about weight—and why a few extra pounds aren’t always as bad as you think. MYTH No. 1: A high BMI means you need to shed pounds. Body mass index, or BMI, is a good starting to point to determine if you’re in shape because it is a simple number that takes into account both height and weight. (You can easily check your BMI using a calculator). But it isn’t perfect—far from it. BMI does not take into account physical fitness or bone structure, and it doesn’t differentiate between weight gained at a muscle-building camp or weight gained at McDonald’s. MYTH No. 2: Weight loss is always good, no matter how you achieve it. Yo-yo dieting can strain the heart, cause gallstones, and disturb your metabolism. It’s better to adopt a healthy diet and exercise program and lose weight steadily—experts generally recommend a pound a week—than to crash diet and shed tons of weight, only to rapidly gain it back. Eating disorders like anorexia and bulimia are very different from crash and yo-yo dieting, but they pose many of the same health risks and also are potentially life-threatening. Anorexia and bulimia can lead to cardiac arrhythmias and other serious problems due to electrolyte imbalances. Purging, or repeated vomiting, can put a serious strain on the heart and damage teeth due to stomach acid exposure. Gans says it is “much better and healthier” to be five or 10 pounds overweight than to constantly lose and gain weight. MYTH No. 3: Slender equals healthy. Sure they look good, but those skinny people may not be any healthier than heavier people—particularly if they have a cigarette hanging from their lips. People who are relatively thin can still carry unhealthy fat internally. This fat is called visceral fat, and it pads vital organs. Thin people who carry internal fat are still at risk for heart disease, type 2 diabetes and cancer, says Gans. “Just because you’re thin doesn’t mean you’re walking away scot-free from disease,” she says. Anyone, thin or not, could be at risk of heart disease or diabetes due to his or her genetic makeup. People often assume that type 2 diabetes is caused by eating too much and exercising too little, but, in reality, about 20% of people with diabetes are thin, and that’s generally due to genetics. What’s more, smokers are particularly at risk for illness. Some people smoke to curb their appetite (thereby staying skinny), but cigarettes can cause lung cancer, chronic obstructive pulmonary disease and heart disease. A 2008 study found that one in four normal-weight people had at least two metabolic factors (such as high triglycerides, high blood pressure, or high blood sugar) in the abnormal range. MYTH No. 4: Fat is fat, and it’s always bad. equal. New research suggests that even if two people are equally overweight, one may be much healthier than the other. 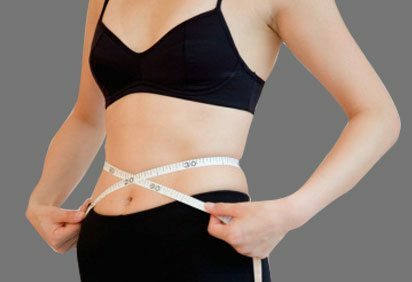 For one, people who carry fat around their midsection are at greater risk for illness than their pear-shaped counterparts, who carry weight in the hips, buttocks and thighs. Belly fat has been linked to a greater risk of erectile dysfunction, Alzheimer’s disease, diabetes and other conditions. But it goes deeper. Some people with extra pounds tend to accumulate fat in their liver; others the same size do not. Researchers now think that obese people with fatty liver deposits are at much greater risk than those without them, particularly because they are prone to insulin resistance, which can lead to diabetes. The problem? It’s hard to tell who’s who. In reality, extra weight is bad for anyone, but it’s clearly worse for some people than others. Whether you can be “fit and fat” is still hotly debated, but physical activity and a healthy diet do tend to offset the risks of being overweight, says Gans. Of course, it depends on how overweight a person is; if you’re only slightly overweight but still active, you may be less likely to experience health problems like high cholesterol or heart disease. Although the term fit tends to be subjective, much of a person’s fitness is based on how quickly his or her heart rate returns to normal; the quicker the heart can recover, the better shape it’s in. So if you’ve hit a stubborn weight plateau, keep working out anyway—you’re doing your heart and lungs a favor. Gans agrees. “You don’t need to be thin to be fit,” she says.